Ickey Woods was born as Elbert Lee Woods on the 28th February 1966 in Fresno, California, USA. He is probably best recognized for being a former professional American Football player, who played his entire career in the position of running back for the National Football League (NFL) team – the Cincinnati Bengals. Previously, he played college football for the UNLV team. His professional playing career was active from 1988 to 1991. So, have you ever wondered how rich Ickey Woods is? According to authoritative sources, it has been estimated that the total size of Ickey’s net worth is over $400,000, as of mid- 2016. Obviously, most of his income is the result of his successful involvement in the sports industry as a professional football player. Another source is coming from his ownership of a women’s football team. Beside that, he has appeared in a number of TV commercials, which have also contributed to his overall wealth. 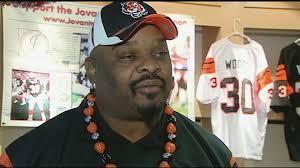 Ickey Woods spent his childhood in his hometown of Fresno, where he studied at Edison High School. While there, he distinguished himself as an excellent football player, so he received a football scholarship from the University of Nevada, Las Vegas (UNLV), where he played for the college team – the UNLV Rebels. Ickey’s professional playing career began in 1988, when he was selected as the 31st overall pick in the NFL Draft by the Cincinnati Bengals. His career was short-lived; however, he still managed to make an impact on the NFL’s history. In his first season, he recorded 1,066 yards and had 15 touchdowns. Unfortunately, it wasn’t good enough for his team to win the NFL Championship, as they lost to the San Francisco 49ers in the Super Bowl. Expecting to continue with great performance in the following season, in his second game of the season, Ickey suffered a torn anterior cruciate ligament, which kept him sidelined for 13 months. He returned in 1991, but he hurt his right knee before the season even began, and missed the first half of the season. He tried to return once more, but he couldn’t return to the form he was once in, and decided to quit playing football. In his short but still rather successful career, Ickey won several awards, including the AFC rushing touchdowns leader in 1988, and being named into the First-team All-Pro and selected for the Pro-Bowl in 1988. Furthermore, he was the AFC Champion with the Cincinnati Bengals in 1988. After his retirement, Ickey started looking for a real job, and worked as a sales representative for a meat company, but also started his own business, owning a flooring store. He appeared in several commercials too, which also increased his net worth, including the one for the GEICO and for Cincinnati Bell, among others. Furthermore, he is also the owner of the Cincinnati Sizzle in the Women’s Football Alliance League. If to talk about his personal life, Ickey Woods was married to Chandra Baldwin-Woods, with whom he has six children. He is also known for his charity work, as he established the Ickey Woods Youth Foundation, and the Jovante Woods Foundation, which ensures education for asthma research as well as education for organ donation.